How do I know my prize was ordered and when to pick up my prize? You will receive an email confirming we received your prize order. Once your prize has arrived we will send another email with information of when and where to pick up your prize once. All prize orders will take 4-6 weeks from the time you redeemed it, till it comes in. Do not come to a prize pick up session if you have not received an email stated your prize has arrived. How do I get points for attending UGA sporting events? 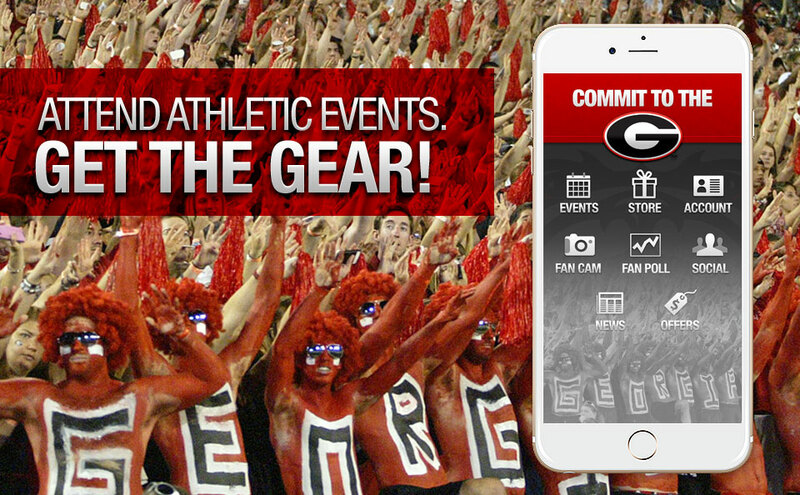 For all non-football events, you will check-in to the event using your Commit to the G app. For football games, you must get your Student ID scanned till 30 minutes prior to the start of the game. What do I do if I cannot check-in at an event using the app? If you are unable to check-in, please email us at promoga@sports.uga.edu with a picture of YOURSELF at the event. Be sure to take the picture where we can what event you are at and which opponent we are playing against. Do I have to be a Georgia student to participate? Yes. In order to be eligible for rewards all participants must fully complete their Commit to the G mobile app account profile with a valid UGA ID number. Do I have to have a smartphone in order to participate? No. At every home Georgia Athletics event there will be a Commit to the G check-in station equipped with iPads that any student can use to “check-in” and earn points. How do I “check-in” to events? Open the Commit to the G mobile app, choose the event you’re attending and tap “Check in to this Event” OR visit the Commit to the G station and follow the same steps on one of the Georgia Athletics provided iPads.